Cost effective tips for choosing your colour palette. Go pop the kettle on, make yourself a brew and settle down to read my budget conscious tips when choosing your garment colour -ways. Ok! Today I am going to chat with you about the beautiful collection you are designing and the rainbow of colours you may be injecting into those designs. 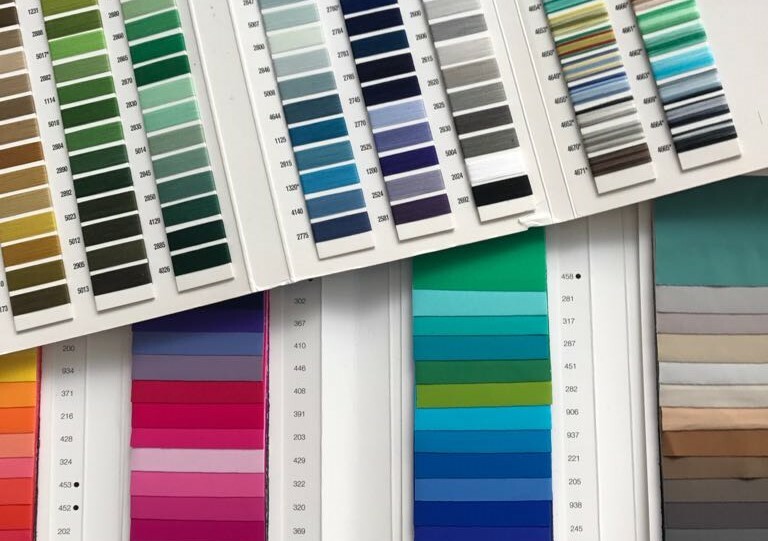 Colours, as beautiful as they may be, can add significant costs to your fabric orders if you don’t apply a few smart tips. Each garment, especially when it comes to Bras and Basques can feature several fabrics and components within each piece, sometimes up to 10 or more items. It is imperative that you are mindful of the colours you feature within each style and across the range before you ‘Sign off’ your collection. Otherwise, whilst you are on your fabric sourcing journey (pink and blue polka dots anyone?) you may begin to encounter some hefty dye fees. You have 6 styles in your collection, which totals 3 lingerie sets. You want your collection to be exciting and full of variety so each set is a different colour. Set 1 is a gorgeous Ruby Red, set 2 is Emerald Green and set 3 is Midnight Blue. Sounds lovely doesn’t it? Now that’s the easy part. Of you skip to Mr Smiths Fabric Store and pick up the exquisite Ruby Red, Emerald Green and Midnight Blue stretch silk satin. Easy peasy. Now all you need to do is find the elastics, fortitubes, powermesh, rigid tricot, bonded foam, shoulder strapping, rings/sliders, hook and eyes etc (I think you get my point) to match those colours perfectly, because we are looking for perfection right? Off you skip again, this time to Mrs Smiths Components Store to get the colour matching items. Low and behold you can only find Pillar Box Red elastics, Blood Red rigid tricot and Scarlett Red bonded foam to match your Ruby Red silk. No matter how hard you look and how many suppliers you reach out too, no one has those perfect colour matches you seek. Now you can’t find it ‘Off the Shelf’, what is your next option? You need to go down the pesky route of bespoke dyeing. No problem for large, established brands producing volumes in their thousands. A little more problematic if you only want to produce a few dozen of each style yet you are facing dye charges of £150 or more for each fabric /component, sometimes amassing a larger dye bill than the actual fabrics cost themselves. There are a few simple tweaks you can make to your collection before you get yourself into this pickle. Everything in your collection must be black throughout your brand for the foreseeable future. But black, white and cream are very easy ‘colours’ to get hold of, so it goes without saying that using these throughout would make the sourcing a little easier. However it is still important to make sure the shades match up well, as slightly different tones of black look ghhhhastly together. 2: Use the one bespoke colour throughout. If your full collection is in Ruby Red it would be far more justifiable to dye the different components this one bespoke shade as you will get more meters of elastic, for example, out of one dye batch, than if it was for just the one style. 3: Have one or two common colours running throughout. If you simply must have the different jewel colours (or which ever colours you would like to inject) within your range, you can use these colours for the main body of the garments on the outer fabric, for example silk or lace cups, wings and knicker panels. The component and trims can then be in a contrasting but compliment colour, such as black elastics and technical fabrics, with gold rings and sliders. If you are on a budget then you may need to use the ‘C’ word ….. ‘Compromise’! Eeash that is a painful word for us creatives to hear, but implementing one of those factors laid out above could make the difference between your collection bringing in a profit or hitting a big fat loss. Our aim is to make sure your product range proves profitable. Small businesses are the lifeblood of the economy after all. So feel free to subscribe to my email list and I will continue to share with you my years of industry experience and knowledge.